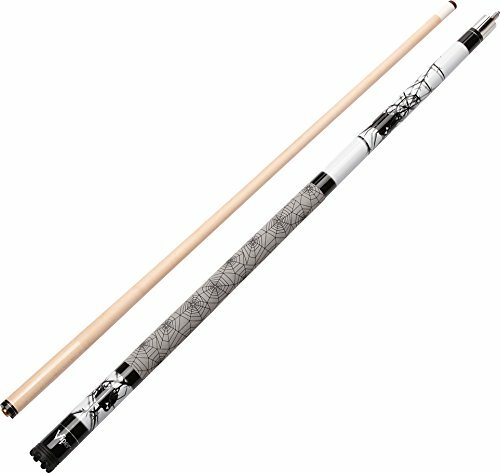 The Viper Revolution 58-Inch, Spider 2-Piece Billiard Cue is constructed from quality hard Canadian Maple wood and features edgy tattoo style graphics down the length of the cue. The eye-catching original graphics and stainless steel rings add to the uniqueness and overall design; finished off with 9 coats of varnish to prevent warpage. Featuring lightweight stainless steel joints which help provide consistent feedback during play and includes a removable scuffer. Simply twist the scuffer off and use it to shape the tip of your cue, allowing for enhanced chalk retention. It’s available in 18-21 ounce cue weights, offering a customizable assortment. Each billiard cue is finished off with a siliconized infused felt wrap to provide a tension free stroke every time and a 13mm Le Pro leather tip. Includes standard 3-year manufacture limited warranty.